Porrum sativum (L.) Rchb., Fl. Germ. Excurs. : 110. 1830, nom. illeg. Allium arenarium Sadler ex Rchb., Fl. Germ. Excurs. : 40. 1830, nom. inval. Allium controversum Schrad. ex Willd., Enum. Pl. : 358. 1809. Allium longicuspis Regel, Trudy Imp. S.-Peterburgsk. Bot. Sada 3(2): 45. 1875. Allium ophioscorodon Link, Enum. Hort. Berol. Alt. 1: 318. 1821. Allium pekinense Prokh., Trudy Prikl. Bot. 24: 181. 1929-1930 publ. 1931. Allium sativum f. pekinense (Prokh.) Makino, Ill. Fl. Jap., ed. 2: 840. 1961. Allium sativum subsp. controversum (Schrad. ex Willd.) K.Richt., Pl. Eur. 1: 199. 1890. Allium sativum subsp. ophioscorodon (Link) Schübl. & G.Martens, Fl. Würtemberg: 220. 1834. Allium sativum subsp. subrotundum (Gren. & Godr.) K.Richt., Pl. Eur. 1: 199. 1890. Allium sativum var. controversum (Schrad. ex Willd.) Nyman, Consp. Fl. Eur. : 736. 1882. Allium sativum var. ophioscorodon (Link) Döll, Rhein. Fl. : 197. 1843. Allium sativum var. pekinense (Prokh.) F.Maek., J. Jap. Bot. 15: 149. 1939. Allium sativum var. subrotundum Gren. & Godr., Fl. France 3: 197. 1855. Allium scorodoprasum subsp. viviparum (Regel) K.Richt., Pl. Eur. 1: 199. 1890. Allium scorodoprasum var. viviparum Regel, Trudy Imp. S.-Peterburgsk. Bot. Sada 3(2): 42. 1875. Porrum ophioscorodon (Link) Rchb., Fl. Germ. Excurs. : 110. 1830. Linnaeus, C. 1753. Species Plantarum, Tomus I: 296..
Govaerts, R. et al. 2018. Allium sativum in World Checklist of Selected Plant Families. The Board of Trustees of the Royal Botanic Gardens, Kew. Published on the internet. Accessed: 2018 Jul. 24. Hassler, M. 2018. Allium sativum. World Plants: Synonymic Checklists of the Vascular Plants of the World (version Mar. 2018). In: Roskov Y., Abucay L., Orrell T., Nicolson D., Bailly N., Kirk P., Bourgoin T., DeWalt R.E., Decock W., De Wever A., Nieukerken E. van, Zarucchi J., Penev L., eds. 2018. Species 2000 & ITIS Catalogue of Life. Published on the internet. Accessed: 2018 Jul. 24.
International Plant Names Index. 2018. Allium sativum. Published online. Accessed Jul. 24 2018. 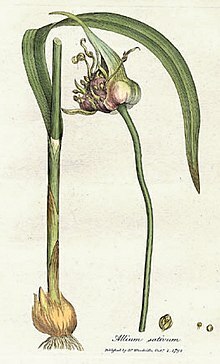 For more multimedia, look at Allium sativum on Wikimedia Commons. This page was last edited on 18 February 2019, at 17:26.